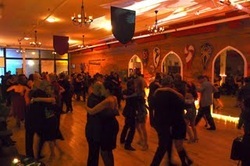 Tango Lesson before Duello - July 29, 8:30-9:30p "Less is More" - how to enjoy dancing when there is not much room on the floor. You will find this lesson beneficial if you are already comfortable with close embrace fundamentals: basic vocabulary, navigation and partnership. Your hosts Pimon, Jud & Semiral welcome you to a traditional central Buenos Aires milonga experience at a venue with the best truly magical ambiance. The music is always the best of the Golden Ages with ever changing dynamics. Our resident DJ, Semiral has been playing tango music since 1996 when he started first regular milongas in Vancouver. He demonstrated his skills in festivals in NA & Europe. Our venue is one of a kind - brick walls with medieval artifacts, a superb hard wood floor and a professional sound system. We provide light snacks and beverages to keep you nourished so that you can keep up with the high energy of the dance floor.